THE TEERITZ AGENDA: Friday 1/6/2018 - Organ Donations, Shots in the Arm, Sons of Asgard Playing for Laughs + Recent Wristwatches. Friday 1/6/2018 - Organ Donations, Shots in the Arm, Sons of Asgard Playing for Laughs + Recent Wristwatches. Here's one more pic of the Laguiole knife, showing the 'Shepherd's cross' inlay of the handle. More about this knife in my previous post. I've been wearing the Oris Diver SixtyFive Movember edition quite a bit over the past month and felt it was time for a switch. Have to say that this is a great watch. Oris really nailed it with this vintage-inspired design. Their Diver SixtyFive range has done very well for them over the last three years and I think this design will be a future classic for the brand. I'm currently writing a review of my other Diver SixtyFive model, but I've hit a bit of a snag with regard to the little story that I'm writing for it. Those of you who've read my other watch reviews may know that I tend to throw in a little story along with the review of the watch. That's just me keeping my hand in the fictional waters. I tend to place the watch in a scenario outside of what many watch reviews place it in. The Diver SixtyFive is a dive watch, but you won't find a face mask or pair of flippers anywhere in my review. I'm trying to show that this watch works just as well on dry land as it does 50 metres below the surface. Anyway, the story has hit a snag, but I think I've found a way through it. Just letting it simmer on the back-burner of my mind, to see if any holes appear. I didn't learn the whole song, just the first verse. But by the time my wife got home from work a couple of hours later, I'd forgotten how I learned it. I still think La La Land should have won for Best Picture last year. The Oscar went to Moonlight, after the Warren Beatty/Faye Dunaway announcement confusion/fiasco. Moonlight was a good film, but in a year which gave the world Donald Trump as President, while taking away Bowie, Prince, Alan Rickman and George Michael way before their time, we all needed something a little light, escapist and hopeful, something that harked back to the last flicker of the Hollywood musical. Like I said, Moonlight was a good film, but it was a little too 'real life'. And real life really sucked in 2016. I grew up reading The Amazing Spiderman comics in the 1970s. I watched the late-Sixties cartoon series on Saturday mornings. I sat through the dreadful movie in 1977, which starred Nicholas Hammond as Peter Parker and became incensed years later when I learned that it was originally a TV show. Throughout this time, I would occasionally buy a Captain America and The Falcon or Fantastic Four comic, and I was also aware of other Marvel heroes like Iron Man. Thor and The Submariner. I occasionally bought Spiderman comics in the early to mid 1980s, but by then, Marvel Comics had three or four different Spiderman titles out each month and I couldn't justify the cost of them. Marvel dipped its toe in the movie waters back in 2000 with the release of X-Men, directed by Bryan Singer. Its $75 million dollar budget was rewarded with a box office gross of just under $300 million. Sequels soon followed. When I saw the first of the Tobey Maguire Spiderman movies in 2002 (Dir: Sam Raimi), I remember thinking that FINALLY, everybody's favourite web-slinger had been been brought to the screen the way he was meant to. Technological advances in CGI meant that Spidey swinging across the streets of New York looked as real as could be. It would only be a matter of time before we'd see other Marvel hero movies. So, I've been a fan of the Marvel movie series released over the last ten years. I thought the IronMan films starring Robert Downey jr were great, and I really enjoyed the Captain America films as well. 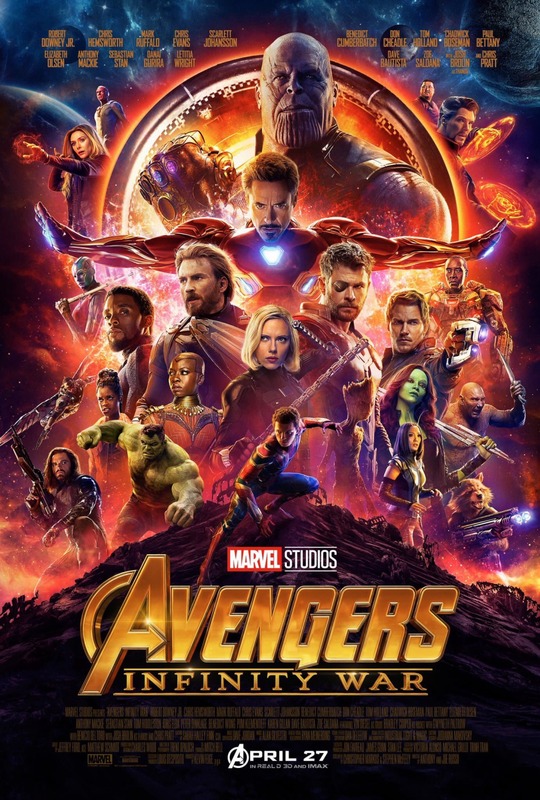 Coupled with The Avengers saga, we end up with a huge cross-referenced story arc beginning with the origin stories of these heroes before involving them in a quest for the Infinity Stones, a collection of crystals that will give unlimited power to their possessor. Once Spiderman and Iron Man hit the big screen, it would only be a matter of time before other Marvel heroes would follow. 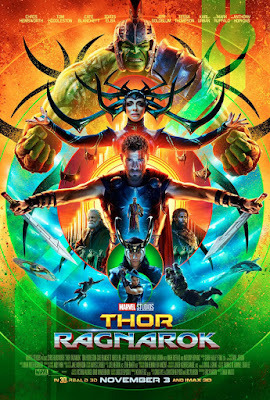 The first Thor film (Dir: Kenneth Branagh, 2011) contained Shakespearean overtones as it told the story of Thor, the Norse God of Thunder, son of Odin the King of Asgard. Thor (Chris Hemsworth) has landed on Earth after being banished from Asgard by his father Odin (Anthony Hopkins) for violating a peace treaty. He lands in New Mexico and is found by a group of scientists led by Jane Foster (Natalie Portman) and Professor Erik Selvig (Stellan Skarsgard). The professor, being Swedish, is well aware of Nordic mythology and it is he who first makes the realisation as to who this stranger with the long blonde hair, huge biceps, and big hammer (with carry strap) really is. Compared to the other films in the Marvel Studios canon, this one presents us a smaller story as we find Thor having to save this New Mexico township from an attack by a Destroyer, a robotic sentinel sent to Earth by Thor's mischievous half-brother Loki (Tom Hiddleston). Anyway, onto this new movie. If the first Thor film gave us a story filled with Norse mythology and the fate of Asgard, this new one, Thor: Ragnarok has an overall sensibility that's closer to the Marvel films Antman and the Guardians of the Galaxy double. Directed by New Zealander, Taika Waititi, this film has a more comedic tone in terms of dialogue and line delivery. Waititi seemed to me an odd choice when I thought of his 2016 film Hunt for the Wilderpeople, a quirky (hated term. Used a lot by reviewers when referring to Australian and New Zealand films) movie about a kid who runs away from home and is grudgingly helped by a grizzly old man as they both end up on the run from authorities. I'm always surprised when I read of a director going from a small-scale, low-budget film to a big Hollywood blockbuster, but Waititi does a wonderful job with this film. Absolutely confident in his approach to a film that's part of a winning franchise. These movies aren't everybody's cup of tea, I'll be the first to admit. But does that really matter? They're mind candy, meant to take us away from real life for a couple of hours. However, they are very well done. The effects are flawless, the casting is great, the writing (especially the dialogue) is sharp, and the storylines do touch on greater themes which help elevate these films beyond the likes of the Fast & Furious franchise, for example. "You know that shot you gave me for the 'flu? Well it worked. I've got it." I went to see Avengers | Infinity War last Sunday morning (movies are my religion) and noticed about half-way through that they'd turned up the air-conditioning in the cinema. Feeling quite chill, I buttoned up my denim jacket and flipped up the collar. Still felt cold. Later that night, my throat began feeling raspy. By this morning, my nose was blocked, I was coughing, and there was a headache on the horizon, which ended up moving in by early afternoon and stayed until about 8 o'clock this evening. And remember, I got that 'flu shot a week or so ago? The movie was good. Earth's Mightiest Heroes (TM) have their work cut out for them in the next - and probably final - installment in this series. I was told that they filmed two movies back-to-back. I think the next one ain't due out until around this time next year. www.impawards.com. I could spend days sifting through that site. May 28th was a few days ago. Ian Fleming was born on this day back in 1908. My Folio Society copy of From Russia With Love arrived two days later. Here it is with the watches that I've been wearing over the last couple of weeks. Lousy photo, sorry. Here's another shot of the Submariner, along with a snap of the inspiration. Okay, it's 7:24pm Friday night and I think I'm gonna crash soon. I hope you're all well, and that you have a good weekend. @ Anonymous, thank-you. Feeling a little worse today, though. A Ted, that was a funny scene!